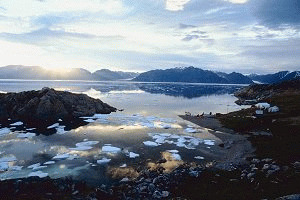 The Kitmeot Region is one of majestic scenery along the Arctic Coast. The adventures of the quest for the Northwest Passage colour this region's history, and details and stories of this quest can be discovered in its communities. Be prepared for stunning rivers, abundant wildlife, and the Northern Lights at their most awesome. The region's central community, this is the place to learn about the culture and history of the people here, at the Arctic Coast Visitor Centre where local history as well as information on attractions is readily available. For information on the famous quest for the Northwest Passage of the 18th and 19th Centuries, this is the place to come! The Northwest Passage Historic Park is full of information on this exciting voyage, with artifacts and even local elders with stories of their own! Sport fishers, get your bait ready, as this is your lake trout and arctic char paradise! Taloyoak is also home to the famous Spence Bay Packing Dolls, which are crafted locally and sold worldwide. This silent yet active community on the western side of the Territory, is home to the stunning Kuklok Territorial Park where river adventures await you! The Northern Lights are spectacular here as they dance in the northern sky behind a still horizon. Green Row Executive Suites Hotel Cambridge Bay 10 Omingmak St.